While I was singing at mass on Sunday, I began thinking about how we are united with God. Some people think of that union as a drop of water falling into an ocean. That image would seem to indicate an obliteration of the individual soul in God. I suppose there are aspects where we are no longer separated from God by our own will and ego. However, I was wondering if perhaps this union is not more like the singing of the congregation. 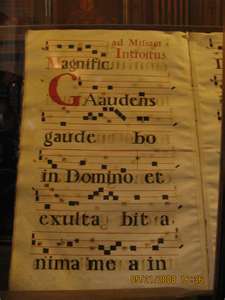 In fact, perhaps Gregorian chant is a good metaphor (and we can only grasp with metaphors, with analogies and the like). Everyone singing in unison, the same melody, different voices and timbres. No one voice stands out, but they all create a beautiful, living, vibrant whole. I think of the new wording of the Nicene Creed which we will recite at mass beginning this Advent where we will speak of Jesus being "consubstantial with the Father." That is, the Son and the Father share one substance, yet they are separate persons. So even in the Trinity, the individual is not obliterated in the divine union. I don't speak of these things from experience. I've been reading St. Teresa of Avila's Interior Castle, and it is clear to me how far I am from what she is talking about. However, God gives us reason, and he gives us desire, and these can inch us along to greater understanding and deeper experience. On Holy Saturday I included a painting by Fr. Sieger Köder. I was very taken by that painting. Here are some places to find out more about Fr. Köder and his art. Pauline Books has a large selection of posters of his paintings, as well as other media. There you will also find a book by Gemma Simmonds about Fr. Köder's art, Glimpses of the Divine: The Art and Inspiration of Sieger Köder. Some blog entries about Fr. Köder include sites at Priya and Rev. Nick Helm. There is an article about Fr. Köder in the November 2010 issue of Catholic Life (article not accessible through this link). 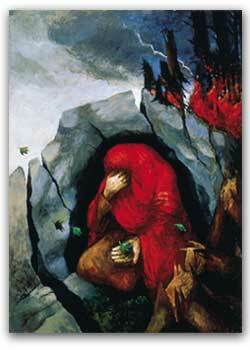 Art can truly help us to meditate on the deep mysteries of our faith, and Fr. Köder's art helps us to do that. It is so hard to live the Lord's Prayer. There is a place near my neighborhood where an off-ramp intersects with another ramp. The ramp I take has a yield sign; the other ramp has the right of way. However, often when I stop to yield for the other car or cars, a car behind me lays on the horn, trying to get me to go. This is how my day starts on my way to work. Fortunately, or unfortunately (depending on the day), this incident is immediately after morning mass. Fortunately, because hopefully I have had an infusion of grace to help me deal with this situation. Unfortunately, if I succumb to the urgent feeling of wanting to indicate to the driver behind me my irritation. This is such a minor thing, and yet it makes me very angry when it happens. Jesus asked the Father to forgive his executioners for they did not know what they were doing. Jesus tells us to turn the other cheek and to pray for our enemies. Today was the feast of the apostles Philip and James, martyrs. They too, were to forgive their executioners. So I should at least be able to get over being honked at. And then there is Osama bin Laden. It is truly difficult to pray for such a man to receive mercy from God. His hatred has cost so many lives. However, Jesus was crystal clear. He was not making a suggestion; he was commanding us. We must pray for our enemies, and bin Laden was Public Enemy Number One. This is where grace transcends our natural instincts. Despite our instincts, this forgiveness is for our own good. It just does not feel that way. However, that is why feelings are not our ultimate gauge for determining the rectitude of an action. Today is a happy day in our archdiocese. 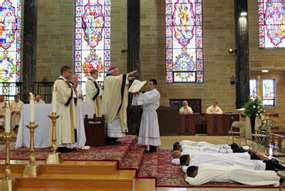 Four men were ordained to the transitional Diaconate by Archbishop Dennis Schnurr for the Archdiocese of Cincinnati: Jon-Paul Bevak from Old St. Mary’s Parish (Cincinnati); Dan Hunt from Old St. Mary’s Parish, Matt Robben from St. Joseph Parish (North Bend); Marc Soellner, St. Andrew Parish (Milford). May God richly bless these men, strengthen them, draw them close to Himself, and fill them with the love of Jesus' Sacred Heart so that they may serve His people faithfully throughout their earthly lives. I caught much of Prince William and Kate Middleton's actual wedding ceremony today. It was a beautiful ceremony, in both its visual beauty and its spiritual beauty. It struck me that the Anglican ceremony has a variety of elements quite similar to a Catholic wedding. The ceremony emphasizes that marriage is intended to be for life. We heard that marriage is intended to be an opportunity for bringing forth children. Furthermore, the ceremony reminds the bride and groom that the purpose of marriage is oriented towards their mutual salvation. Finally, we are told that human marriage reflects the union of Christ and His Church. All of these are critical aspects of what a marriage is. Unfortunately, these values were utterly lost in the media coverage. All of the emphasis of the coverage was on spectacle. So much spilled ink and blather about "the dress." One would scarcely be aware that there was a religious ceremony involved. This is why the motto for Engaged Encounter is so powerful: "A wedding is for a day. A marriage is for a lifetime. The Nicene Creed calls us to be mindful "of all that is seen and unseen." These are things that William and Kate may very well understand. These are not things, however, that those covering their wedding understand. And unfortunately, they are not things that many couples understand upon entering marriage these days. Those involved in marriage preparation ministry have their work cut out for them. The Bishop of London gave a beautiful sermon at the wedding. If only the media coverage had picked up on some of his themes. He began by quoting St. Catherine of Siena, whose feast day is today. Then the Bishop said something that no one in the media seemed to find noteworthy, perhaps because it was to them a "dog bites man" story: "As the reality of God has faded from so many lives in the West...." Yes, the sacrament was lost, and only the spectacle seen, like smoke seen from a distance too far to observe the fire itself. So said St Catherine of Siena whose festival day this is. Marriage is intended to be a way in which man and woman help each other to become what God meant each one to be, their deepest and truest selves. Many people are fearful for the future of today’s world but the message of the celebrations in this country and far beyond its shores is the right one – this is a joyful day! It is good that people in every continent are able to share in these celebrations because this is, as every wedding day should be, a day of hope. In a sense every wedding is a royal wedding with the bride and groom as king and queen of creation, making a new life together so that life can flow through them into the future. William and Catherine, you have chosen to be married in the sight of a generous God who so loved the world that he gave himself to us in the person of Jesus Christ. In the Spirit of this generous God, husband and wife are to give themselves to each other. The spiritual life grows as love finds its centre beyond ourselves. Faithful and committed relationships offer a door into the mystery of spiritual life in which we discover this: the more we give of self, the richer we become in soul; the more we go beyond ourselves in love, the more we become our true selves and our spiritual beauty is more fully revealed. In marriage we are seeking to bring one another into fuller life. It is of course very hard to wean ourselves away from self-centredness. People can dream of such a thing but that hope should not be fulfilled without a solemn decision that, whatever the difficulties, we are committed to the way of generous love. You have both made your decision today – “I will” – and by making this new relationship, you have aligned yourselves with what we believe is the way in which life is spiritually evolving, and which will lead to a creative future for the human race. We stand looking forward to a century which is full of promise and full of peril. Human beings are confronting the question of how to use wisely the power that has been given to us through the discoveries of the last century. We shall not be converted to the promise of the future by more knowledge, but rather by an increase of loving wisdom and reverence, for life, for the earth and for one another. Beteth his wynges, and farewell, he is gon." As the reality of God has faded from so many lives in the West, there has been a corresponding inflation of expectations that personal relations alone will supply meaning and happiness in life. This is to load our partner with too great a burden. We are all incomplete: we all need the love which is secure, rather than oppressive. We need mutual forgiveness in order to thrive. As we move towards our partner in love, following the example of Jesus Christ, the Holy Spirit is quickened within us and can increasingly fill our lives with light. This leads on to a family life which offers the best conditions in which the next generation can receive and exchange those gifts which can overcome fear and division and incubate the coming world of the Spirit, whose fruits are love and joy and peace. God our Father, we thank you for our families; for the love that we share and for the joy of our marriage. In the busyness of each day keep our eyes fixed on what is real and important in life and help us to be generous with our time and love and energy. Strengthened by our union help us to serve and comfort those who suffer. We ask this in the Spirit of Jesus Christ. Amen. I have to admit, I'm a sucker for a guy who quotes Chaucer in the original Middle English. The beauty of Catholicism (and in this regard, Anglicanism, too), is that we do not need to choose between spectacle and sacrament. God made us bodily creatures, not incorporeal angels. He made us take in the natural world through the senses, and He makes the supernatural world present to us through the senses as well. That is why sacraments have form and matter, so that we could take in the unseen by way of the seen. That is why we cannot choose one without the other. Spectacle without sacrament is a shell without a nut; sacrament without spectacle is ascending a mountain so high that one suffocates at the summit from lack of oxygen. Usually when we say "This is not my day" we mean that we are having a bad day. Things are not turning out as we had planned. However, I have recently tried to say early in my day, "This is not my day" to remind myself that this is God's day, not mine. "This is the day which the LORD has made; let us rejoice and be glad in it" (Psalm 118:24). I should be seeking to fulfill His plans, not mine. The success or failure of my day should be benchmarked against how much my actions conform to His will. Everything I have is God's, not mine. That includes my time. It is often the distractions and the obstacles that are where we are most closely encountering God in our day. When we appear to be most off course, most off track, it is precisely then that we are often most engaged in doing God's will. Ironically, it is when I accept the fact that "This is not my day" that my day will be better, not worse. Tonight we watched a documentary film called Barnstorming. It is a wonderful story about two men who fly antique planes and in 1999 set down in a hayfield on a farm in Indiana. They form a friendship with the family who owns the farm, and year after year the pilots return to renew that friendship and spread the love of flight. One of the interesting aspects of this film to me is the Dirksen family who own the farm. Matt and Paula Dirksen, along with their large family, portray their Catholicism in very quiet but visible ways. I first noticed the crucifix on a bedroom wall. Then there was the sweatshirt of one of the daughters, which read "Seton" (with a cross forming the "T" in the middle of the name). The family said grace at the table, using the common Catholic prayer of "Bless us, oh Lord, and these thy gifts...." There was the size of their family (six or eight children, I didn't get a certain count). And that was it. No more than that. But that was quite a bit. Quite a bit, indeed. It's the little things that add up to big things. I remember being at a faculty interview session a number of years ago where a candidate was facilitating an exercise. The exercise was geared to show how race is invisible for some and visible for others, but in this case it revealed something else to me that I never forgot. We were asked to describe ourselves with three words. I was thinking of words like "patient" (I forget the other two adjectives), focusing on descriptors that were pertinent to me and my individuality. However, one of the current faculty members included among his words "Catholic." That descriptor had never occurred to me. He said but a simple word, yet that example of faith and Catholic identity has stuck with me over the years, and I have tried, with varying degrees of success, to live up to his example. Our Catholic identity is part of our responsibility to bring the Gospel to the world. It helps us to build a community that strengthens each other when challenged by a sometimes very hostile culture. It helps us to give witness to others that our faith permeates every aspect of our lives and is not a mere accessory. The resurrected Christ in His glorified body still bore the marks of the Cross. Those marks caused Thomas to believe. We, who are the Body of Christ, are marked through our baptism and confirmation. Those marks can be a source of faith for others if we just let them. I am a cradle Catholic who considered the priesthood for several years, then fell away from the Church and God altogether for many years, returning to find that I had little understanding of either the riches of the faith or the depth of God’s love and grace.